The bite was like that of any other fall king salmon hitting a trolled baitfish in one of Oregon’s coastal bays. At first the rod tip slightly twitched. Tap, tap. Then it dipped down a couple times, followed by a single, long downward motion, almost to the water. The rod completely buried over, and line began disappearing from my client’s reel. “It’s a good one,” exclaimed Carl Johnson, who was now fighting one of the trophy-size kings that has made the Chetco River legendary among anglers hoping to catch a mammoth salmon. Forty-five minutes later, I slid my net under the chrome-bright, beast of a salmon. The fish, weighing 58 pounds, proved why the Chetco is perhaps the best fishery outside of Alaska or British Columbia for catching trophy Chinook salmon – and it opens today. The majority of the salmon that return to the Chetco, located just a few miles north of the California border on Oregon’s South Coast, are four-year-old fish, meaning they weigh anywhere from 20-30 pounds. 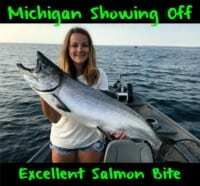 As many as 20 percent of the run – one in five fish – are five-year-olds kings, salmon that weight in the upper 30-pound and lower 40-pound class. 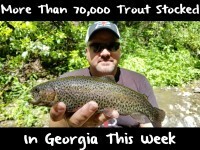 And a small portion of the run are giant six-year-old fish, those highly prized trophy fish of 50 and even 60 pounds. Many Oregon rivers have large runs of three-year-old kings, those 12-15 pound cookie cutters. The Chetco, however, is likely an angler’s best bet at a legitimate trophy salmon. The kings begin entering the estuary and tidewater in late September. 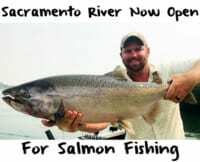 This year, from October 1-12, anglers are allowed to fish both the mouth of the river, and the near coastal waters in the ocean, where kings stack up, waiting for enough rain to head upriver. Known as the “bubble season” because of the bubble-like-shape of the boundary in the ocean, the October fishery has grown in popularity for anglers seeking big salmon. New this year, instead of the normal one-fish-per-day limit, anglers may keep two salmon a day, one of which must be a hatchery fish. A large hatchery run is expected back to the Chetco this fall. After the ocean season closes, the estuary will remain open for trolling, while the river above tidewater also will be open to “bobber fishing only” regulations, allowing anglers to fish bobbers and eggs for the kings staging in the deeper pools of the Chetco. The bobber regulations are intended to reduce illegal snagging of salmon in the river, which has been a problem in recent years. On Nov. 4, the Chetco opens to all techniques, meaning plugs and back-bouncing roe will be allowed. The ocean and estuary portion of the season, which takes place in late September and all of October (remember, the ocean is only open Oct. 1-12) is one of my most popular seasons for guiding. Customers often book a year in advance, hoping to tie into one of those 50-pounders that make the Chetco famous. The ocean and estuary season is particularly popular because the kings are chrome-bright, and their meat is prime. I mainly troll plug-cut herring and whole anchovies for the large kings of the Chetco. In 10 years of guiding for the big salmon, I’ve enjoyed tremendous success with brined baits. While Pautzke’s Fire Brine is a proven fish catcher at the mouth of the Chetco, I also usually brine up some herring and anchovies with my old standby, which precedes the Fire Brine. I’ve found the Chetco kings like baits brined in a combination of Pautzke Nectar, water, salt and Fire Power (krill powder) or a few tablespoons of Pautzke Fire Cure. Some years baits brined in Blue Fire Brine are the ticket, especially if the salmon are in the ocean and haven’t come into the river yet. In the estuary – the section of the lower river from the tips of the jetties to the Highway 101 bridge, the combination of Pautzke Nectar, Fire Cure, salt, water and Fire Power seems to work best. Fire Cure is a fast acting cure. I will brine the baits for a few hours before fishing and they are ready to go. The combination of pickling or rock salt, water, Pautzke Nectar, and Fire Cure takes a little longer to brine the baits and seems to work best when the baits are allowed to cure overnight. In the lower river, I troll with 2-6 ounces of lead fished with a wire spreader, 18-inch dropper and 5-foot leader. Sometimes I use a Big Al’s Fish Flash flasher, especially at first light. In the ocean, I use downriggers if fishing beyond the red buoy, which sits in 50 feet of water. Closer to shore, I use the spreader and lead weight rig instead of a diver. I’ve found the kings will be closer to the bottom when they are staging just off the beach or jetties, and the lead rig gets baits down more effectively than a diver. I will use a line counter reel and let my customers know how much line to let out when trolling in close. Each year we catch a lot of kings in as shallow as 18 feet of water just off of the beach or right outside of the jetties. Once the rains come, the Chetco’s salmon will shoot upriver. There, we use plugs, divers and bait, and back-bouncing techniques, which will be detailed in a future blog for Pautzke. Editor’s Note: Guide Andy Martin owns and operates Wild Rivers Fishing (www.wildriversfishing.com) and he has several top guides working for him on the Chetco, Smith, Rogue, Elk and Sixes rivers. His clients have caught the modern day estuary record, the 58-pounder caught by Carl Johnson, as well as the river record, a 65-pound king caught in 2011 by Wayne Smith near Moffit Rock.